Do you have time on your hands on a Thursday evening and would like to find a new hobby? 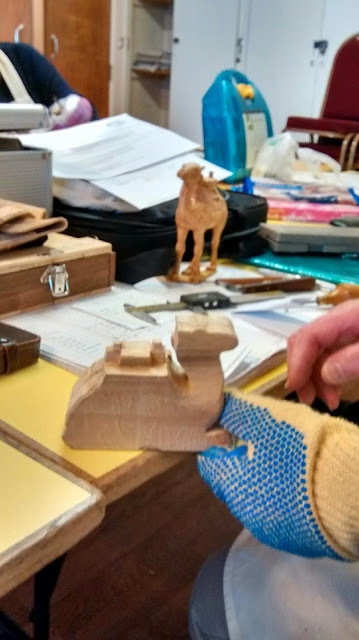 Why not try visiting Mudeford Carving Club and see if it suits you? We meet every Thursday night so you would be most welcome to visit and try out this fascinating hobby! Thursday evenings 7:00 - 9:00 pm. In 1997, Joyce Wareham, a lady passionate about wood-carving formed the Mudeford Carving Club. The club first met in the scout HQ in Bargates, Christchurch, but now meets in the Maberly Room at the rear of Stanpit Village Hall. Ron Pflaumer - 2011. Awesome Inc. theme. Powered by Blogger.